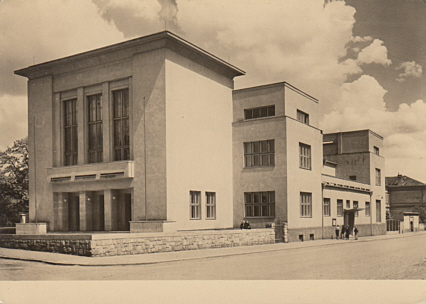 Built 1946-1950 by Vít Nepor. Opened 29 Oct 1950. Named in honour of the Czech author and communist politician, Julius Fučik (1903-1943). Closed 1989. 2002-2003 rebuilding. Re-opened as "Vrchlického Divadlo", named in honour of the Czech writer, Jaroslav Vrchlický (1853-1912). Reverse Text: "Louny, Fučikovo divadlo"